Circuit West features 500 kilowatts of rooftop solar power between Bridge and First streets in Grand Rapids. A new energy storage battery is located a block away from the array. 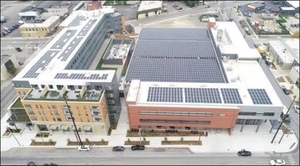 GRAND RAPIDS, Mich., Jan. 24 /CSRwire/ - Consumers Energy today dedicated Michigan’s first ever rooftop solar array and battery storage system in a vibrant and growing area of Grand Rapids. Nearly 1,800 solar panels atop the Bridge Street Market and adjoining buildings between Bridge and First Streets within the Circuit West district are accompanied nearby by a 500-kilowatt battery. It’s the first such energy distribution setup in Michigan and one of the first in the country intended to make renewable energy increasingly reliable and cost effective. Circuit West is a 13-block district of innovative electricity generation, distribution and storage and energy efficient building construction. Circuit West is led by Consumers Energy and Rockford Construction. Stabenow was joined by leaders from Consumers Energy, Rockford Construction and the City of Grand Rapids to announce the electric distribution and storage system today at the West Michigan Center for Arts and Technology, 614 First Street NW, one of the many new buildings springing up within Circuit West. The Circuit West battery, which goes into commercial operation in a few weeks, joins a 1-megawatt battery installed last fall at the company’s Parkview Substation on Western Michigan University’s Kalamazoo campus. Rochow said Consumers Energy is studying each battery’s performance to determine how to best use and integrate the technology across the electric distribution grid. Consumers Energy earlier announced it will construct a new Grand Rapids office building within Circuit West. Construction is expected to begin later this year.